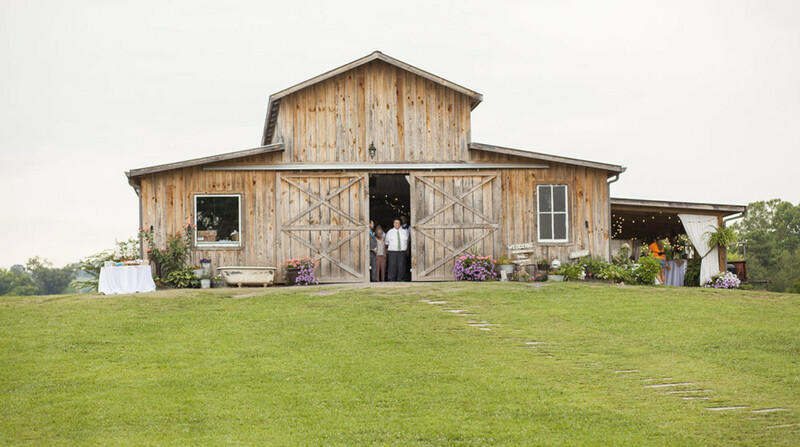 Tennessee charm abounds at this spacious, family owned and operated barn. 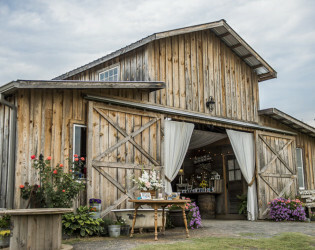 This property, located north of Chattanooga, allows for additional wedding planning flexibility: choose between exchanging vows on the sunset side of the barn, or beneath the cedar wood arbor. 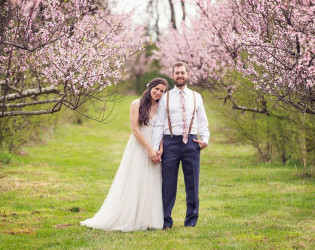 For party photos, opt for the peach orchard across from the barn when the trees bloom in the springtime. Thank you for considering our venue for your special day! We are proud to have just had our 5th year anniversary & we look forward to many more years of helping enable lots of folk to make their precious memories here! ~~Hours of availability for the venue, for any event are tentatively set as 8am till 10:30pm-ish. That's something that most times, we are able to be flexible on & I'm happy to discuss a plan for what works best for you. Many people also book the day before, as well, for a prep-time/setup/rehearsal day &/or even a place for a casual rehearsal dinner location. Available hours for a "day before," or to have a "prep-time/setup/rehearsal" type day, are 8am till 9pm. If you have any questions about this, please ask! The pricing below is for the indicated months listed & include most all of the basics, as far as tables, chairs/seating, lighting & LOTS of neutral décor as well as MANY other essential & popular items. $2700 for up to 100 guests. $2900 for up 200-225 guests, which would be the highest number we could accommodate without additional options. $1900 for up to 100 guests. $2300 for up 200-225 guests. ***Events scheduled on WEEK DAYS or SUNDAYS are discounted in the amount of $250. ***We can further discuss your guest count & other details & how to most effectively estimate how many you will have in attendance. Booking deposit The deposit due to officially reserve a date(s,) is half of the total amount or half of the daily rate/cost for the main event day. The remaining amount (your unpaid balance) will be due & must be received at least 30 days from your intended date(s) that you have chosen to reserve. ***PLEASE BE ADVISED: Deposit/retainer costs paid at the time of booking or any balance payments, etc, are all nonrefundable. HOWEVER, under certain circumstances & with adequate notification (which is at least 90 days prior to your event) we may be able to accommodate a cancellation & a one time rescheduling of your event. This allows you to possibly choose another date within the same calendar year. Several rules do apply & more details can be made available to you at time of booking. Everyone or every group, does not necessarily require a setup or rehearsal day. However, for those that prefer this option & book a Saturday event, (depending on availability,) we do offer the option of booking the day before an event date for a cost of $575. This means the venue would be available to you ALL DAY on the day prior, from, 8am till 9pm & this time would enable you to come up with your helpers/family, get your tables dressed/set, arranged & decorated, make any alternate plans/arrangements, have your families/bridal party out for a gathering/rehearsal & even your have a rehearsal dinner here at the barn, if you choose. **If it happens that the day before your event is already booked, we can work with you on options for doing your set-up for you. The cost for this option is not included in the above pricing & is only quoted on an individual event basis. **IN ADDITION... If you just need an hour or so of rehearsal time, we are glad to help with this too. This would be based on date/time availability & would typically be on a weekday/evening, during the week prior to your wedding. We do not charge you for this small portion of time. There are LOTS more goodies that aren't listed here, but THIS is where start! 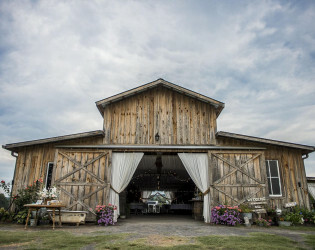 ~Our main outdoor ceremony area: We do have a lovely rustic cedar post arbor which is a square structure that measures 10x10 ft in the front & tapers to 8x8 ft on the back side. This is something that you may want to use for your outdoor ceremony & you may choose to leave it natural or it can also be decorated according to your preferences & specific ideas/details. 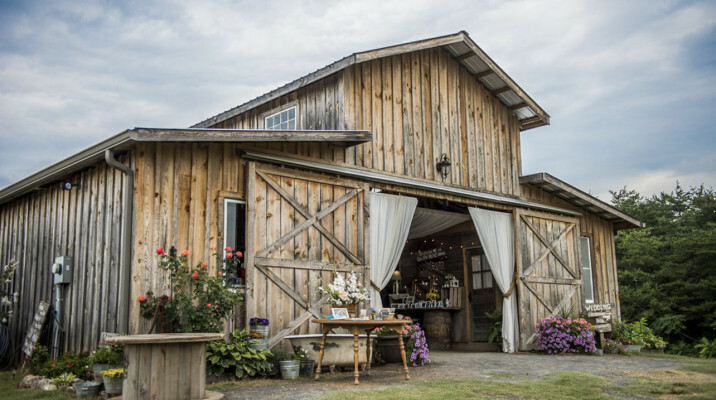 ~Our Barn is a 40x80 wooden structure with a concrete floor. 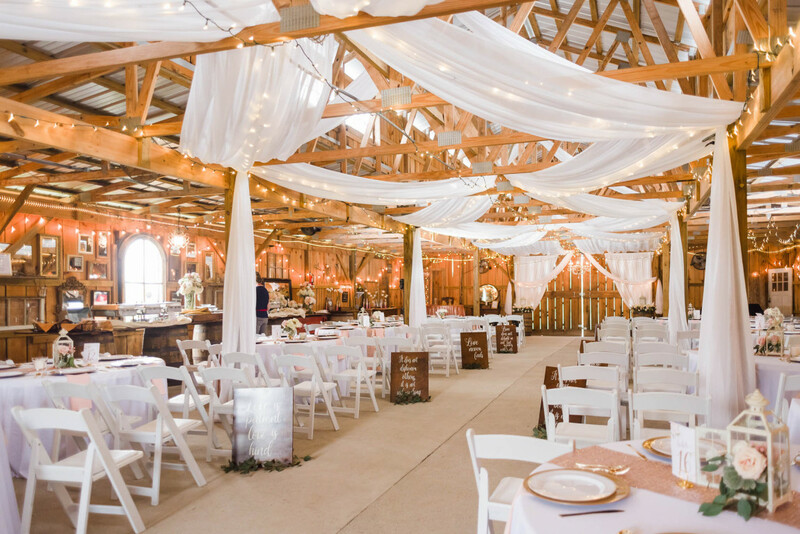 There is also a 16×40 covered area out back, complete with beautiful cafe string lighting. Great for all sorts of "over-flow activites" & mingling guests. 1~ 3ftx4ft rectangle wooden table, used on our DJ platform. ~WE PROVIDE TABLECLOTHES... White lap-length (90in round) tableclothes/linens are included for all the above tables described. 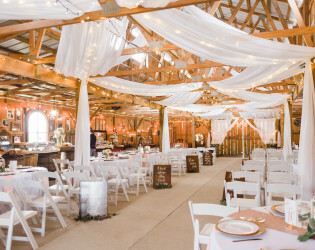 ~WE PROVIDE all the lighting & draperies that you see in our website & Facebook photos. ~A small indoor sound system that does support the use of an iPod, Ipad & other basic electronic devices. 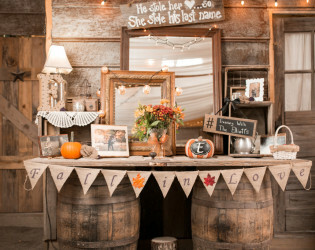 ~TONS of rustic props & signs! 1~Big white vintage claw-foot tub. ~LOTS of various sized, small & large metal galvanized tubs for icing down drinks &/or other creative purposes. 8~ Shepherds hooks to use as isle markers or isle decor. We can also provide you with hanging mason jars to use with shepherd hooks. 1~ 3 tiered wood slice cupcake/dessert stand. TREE SLICES We have a huge selection of these in various sizes. ~We have GREAT SECLUDED & WIDE OPEN SPACES! 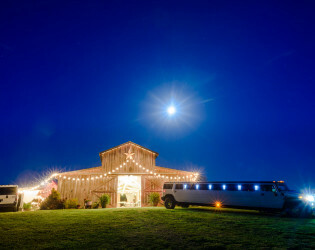 Our venue sits all by itself, on a hill, with nothing but plenty of rolling hills, trees & peaceful fields all around us. 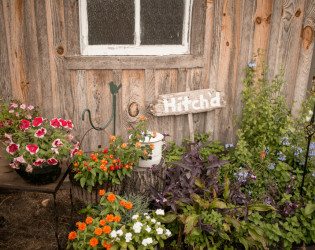 During spring, summer & fall, there are always beautiful flowers & lush ferns all around the barn, to add to our natural gorgeous outdoor scenery. The early spring months are super exciting & you will LOVE our 800 tree peach orchard that blooms an ocean of pink & purple flowers. The orchard blooming times vary every year & have a very small window of opportunity (only about 2 weeks, tops) so please let us know well in advance if you want to use this area during our blooming season. 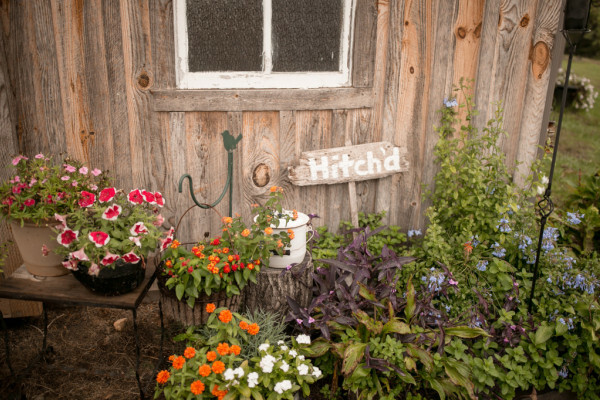 That way we can keep you informed on when the blooms are almost ready & you can make arrangements to be here with your photographer. ~Vintage flatbed trailer, which makes a fantastic "cocktail table area" for mingling guests. 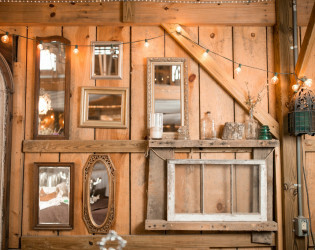 ~THERE ARE LOTS & LOTS of other décor items!! It's just IMPOSSIBLE to list our entire inventory. All of the above items are optional, but they’re also INCLUDED in all pricing levels at no additional cost to you. Our Kitchen the barn has a small standard catering kitchen with a refrigerator, a small deep freezer, a new range/stove & oven, a microwave, basic sinks & a small area of shelving & counter space for whatever you may need it for. 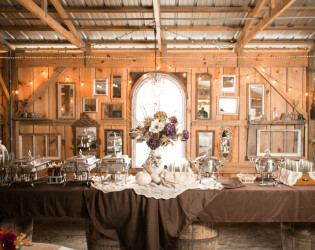 We do provide trash bags, toilet paper, etc..
Bride's room Many choose to use this room as a great photo op as well as a place to get dressed, ready & relax… or for whatever your needs or preferences might be. (This room has a beautiful vintage couch & chair as well as a restroom.) There is also an additional restroom in the barn, right outside the bride's room. 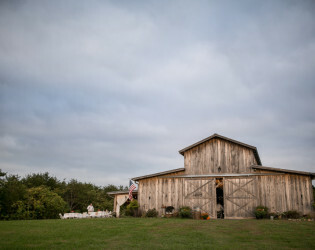 Heating options: Our barn is not a climate controlled facility. However, we have several large, stand-up propane heaters that are available for rent on an "as needed" basis, for $30 each, as well as several hanging electric heaters. Depending on weather, you may or may not need them so it's best to make that call closer to your event date. We do have a fire-pit & availability is based on any possible drought or dry weather issues. If there's no burning restrictions at this time, you may provide firewood for a fire. Must be discussed prior to your date & our policies & guidelines regarding fire safety must be adhered to. Fire pit must have an attendant at all times & must be completely extinguished at the time you are leaving the property. PLEASE BE ADVISED: Suggesting a "byob" type arrangement to your guests, is NOT an option. This is a very important subject & a HUGE RESPONSIBILITY for those that have the task of organizing food for large groups of people. While we do not require you to pick you caterers from a certain list, however we do have some specific guidelines & expectations here. We are happy to help you explore your options & develop a plan for food for about any sized group. However, for most large groups, we do not recommend a DIY catering plan. I'm glad to explain this further & answer any & all questions that you may have. When you begin looking into your options on food, PLEASE be aware of the differences many places offer in the way of "catering" &/or food delivery. Many times details can be vague & confusing. We can help you with this type of planning based on your budget. **Longer white or black, almost floor length table cloths/linens (108 inches round) are available for use at $5 per table/linen. **Assorted Burlap table runners/table covers are also available for rent at a cost of $2 a piece. 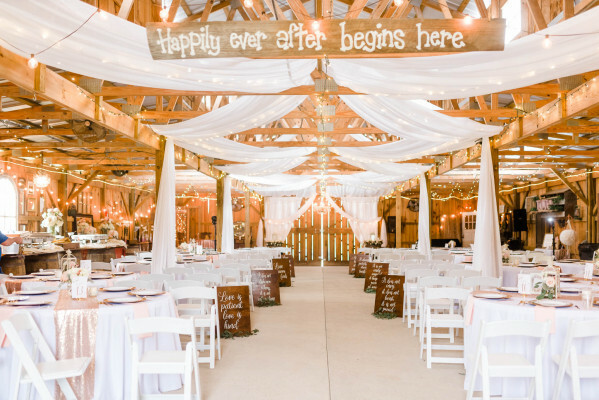 **Overlays (70x70 square) which are typically used in addition to the white round linens that are included in venue rental. We have these in Navy OR Dove Gray & can be rented for $3 each. ~SATIN RUNNERS AVAILABLE in Navy Blue, Blush Pink, Burgundy, Dark purple/plum & Gold. Polyester runners available in Royal Blue. Wide custom made runners available in Dusty Rose, Ivory Damask & Chocolate Brown colors & all rent for $3 per runner. ~One large rectangular Gold sequin table cloth, PERFECT for use on the "sweet-heart" or cake table. This item rents for $10. ~Coming in May, we will have also have 17 ROSE GOLD SEQUIN runners as well as a matching rose gold sequin table cloth (108in round) perfect for sweet-heart or cake table. These runners will rent for $4 each & the sequin table cloth will rent for $10. We can gladly help you with basically "knowing what to expect" & how to assume costs for most all the things you may want or need. I hope this information is helpful but if you do have any additional questions, please do not hesitate to give me call!! Again, thank you for your inquiry! I'm very blessed to be doing what I love to do! We look forward to many more years of being apart of so many beautiful days! To enable everyone in attendance at your event to have the best experience possible here, we gladly offer a great setup/cleanup package where we do all your setup & cleanup. A quote for these services is available upon evaluation of your details at time of booking. Basic pricing for this service begins at $375. We do not have onsite accommodations. However, we can recommend two nice hotels within 10 minutes of our venue. 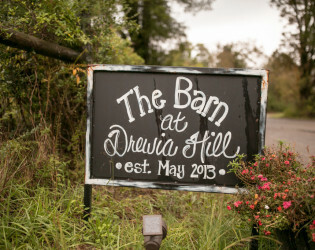 The Barn at Drewia Hill (proudly named after our Great Grandfather & pronounced Drew-ee,) is a rustic barn venue that sits on a lovely, breezy hill, nestled in the middle of a beautiful wide-open, 100+ acre field with GORGEOUS & serene views in every direction... it's what we like to call "God's country." 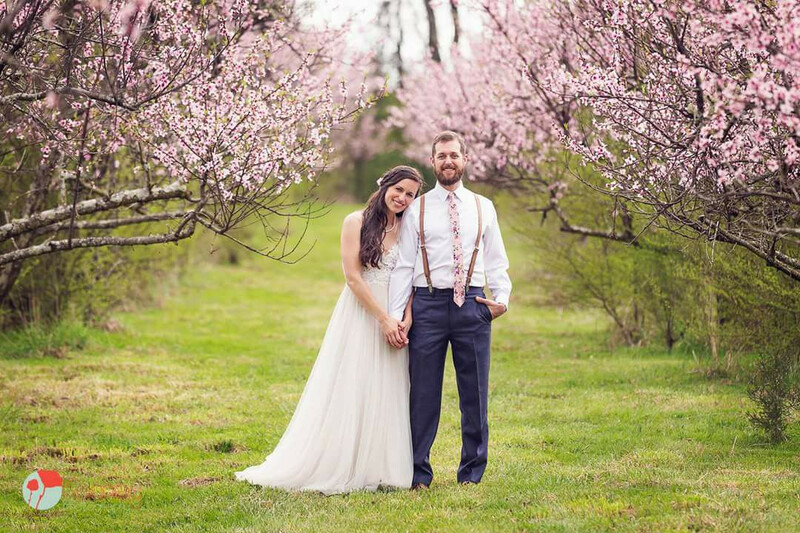 With an 800 tree peach orchard that blooms an ocean of pink flowers in the spring, to the wide-open rolling fields all around us... there is no shortage of truly breath taking scenery here at our farm. We can recommend many reliable & excellent vendors with very reasonable options for each & every service that you may need for the day of your event. We are ready to assist you in customizing whatever event you might be planning & we look forward to helping you make your beautiful dreams a reality! Being at our venue has the feel of being somewhere far removed from the hectic stir of big cities or crowded neighborhoods... However, we are located in north Hamilton County which is only about a 25-30 minute drive from downtown Chattanooga, Tennessee. Also, we are only 10 minutes from the city of Dayton & only about 20-25 minutes west of Cleveland, Tennessee. 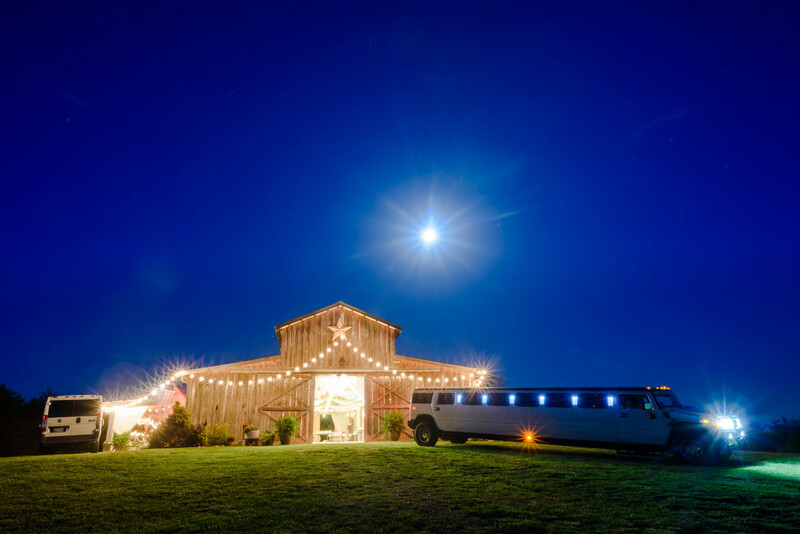 There are multiple retailers, restaurants, boating & fishing areas, historical sites & also several nice hotels that are within about 10 minutes of our venue. 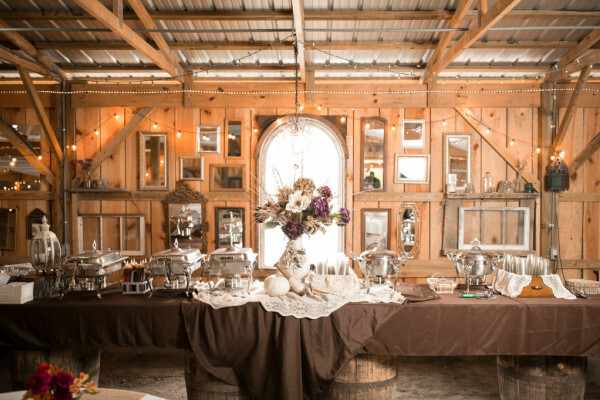 Our venue provides a beautiful & color neutral, rustic setting that can be enhanced with your personal touches & is only limited to your own creativity & imagination! 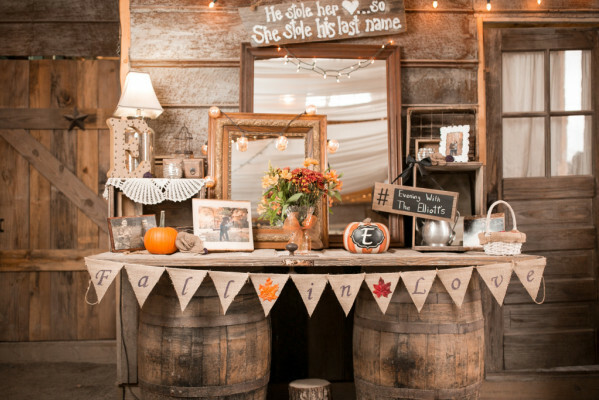 We have LOTS of vintage items & props for staging all types of gorgeous events. Most of these items are available to renters at no additional cost. Our venue provides 150 white folding chairs, 17 round tables with white linens, several rectangle tables, lots of whiskey barrels & several vintage furniture items. 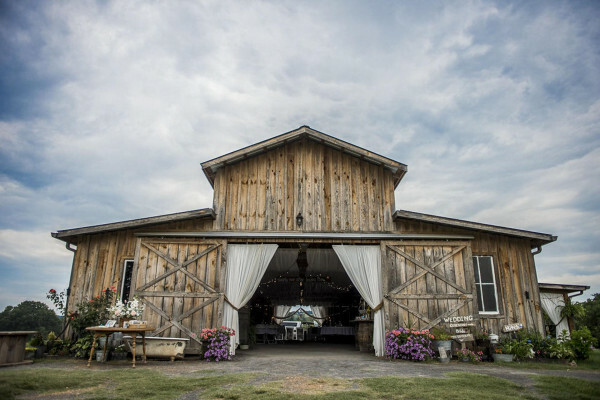 Awards & Notables In 2015, on the website & blog, "Only in Tennessee," we were named as sixth in Tennessee's most beautiful venues. Nominated for Chattanooga's 2016 Best of the Best, venue award. Great Facebook reviews from lots of those who have been here & used our venue & services. 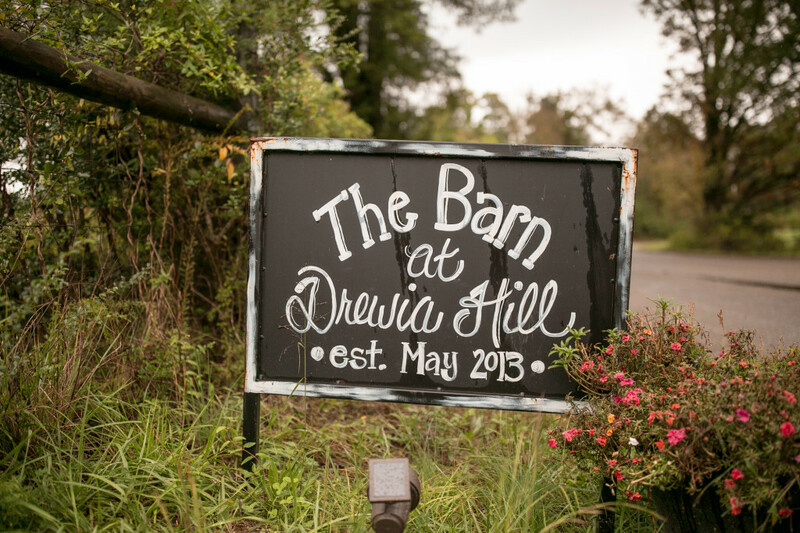 The Barn at Drewia Hill is a rustic event venue which sits on a small, breezy hill that is nestled in the middle of a beautiful wide-open, 100+ acre field with GORGEOUS & serene views in every direction. 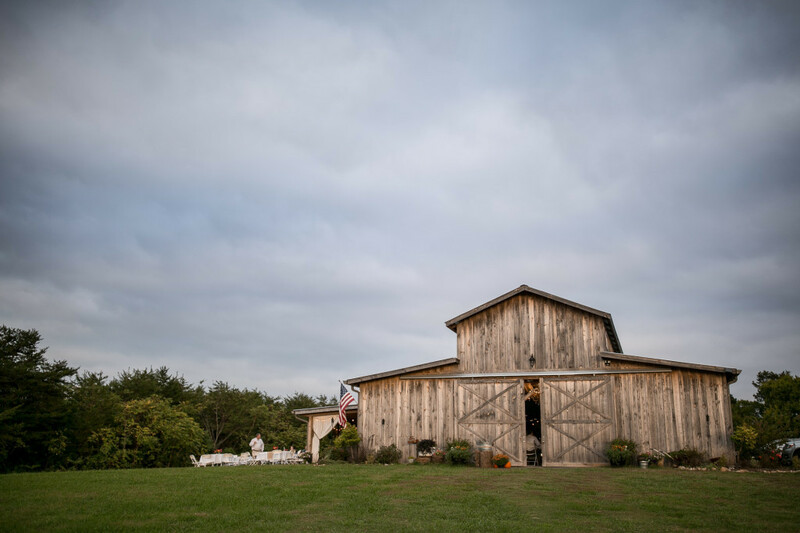 With an 800 tree peach orchard that blooms an ocean of pink flowers in the spring, to the wide-open rolling fields all around us, there is no shortage of truly breathtaking scenery here at our farm. 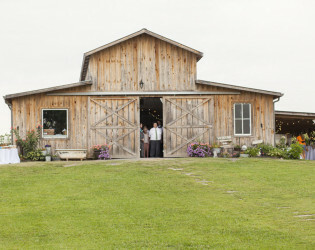 The barn itself is 3,200 square feet and has a generous seating capacity for up to 250 people. We are located in north Hamilton County which is only about a 25-30 minute drive from downtown Chattanooga, Tennessee. 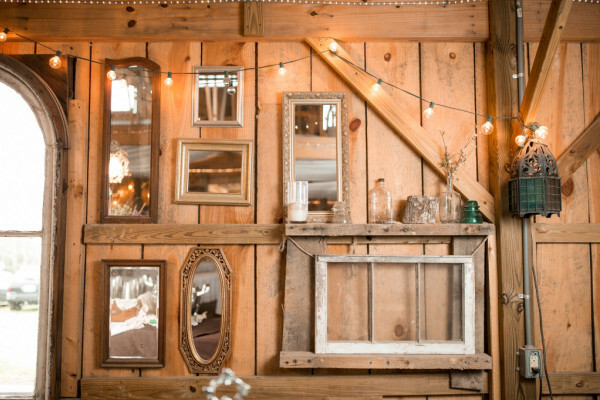 Vintage decor adorns the old rustic walls of the barn. 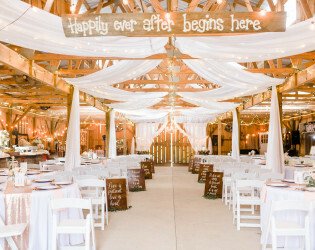 Ceremony setup for inside the barn. One our beautiful couples in our blooming peach orchard, Spring 2018. Night view of our venue. Limo, courtesy of ATL One Limo.